I recently listened to an episode of Pete Matthew’s brilliant Meaningful Money podcast entitled: MMP129: Celebrity Fund Managers. Article: Why You Shouldn’t Listen To Stock Tips! Article: How Much Effort Should I Spend Trying To Beat The Market? NONE! Podcast: Session 22 – Why Choose Passive Investing? Quiz: Can You Predict Future Stock Market Performance? Anyway, back to Pete’s podcast episode and the arguments for passive investing. After giving the celebrity (and “top performing”) fund managers the slating that I think they deserve, he also (very diplomatically) tries to present the arguments for these funds and their managers. In doing so (in his things to do section), where Pete is really having to look hard for arguments in favour of going with active funds, he suggests to research funds through MorningStar to filter the 4-star and 5-star funds. This is where it got me thinking. Immediately, the classic “past performance isn’t a predictor of future results” mantra came to mind. Pete presents a fact at the beginning of the podcast that less than 5% of active fund managers were able to stay in the top half of the performance tables for 5 years in a row. Interestingly, if everything was left to pure chance (the monkey throwing darts to pick stocks), a randomly selected fund manager would have a 50% chance of finishing in the top half. For five years in a row, the probability would be 50%^5 = 3.1%. Therefore, you can see that there isn’t a proportion much higher than we would expect if everyone was equal. My takeaway from this is this you are going to be VERY lucky to be able to find that 1-2% of managers that will finish in the top half on a consistent basis due to anything beyond chance. Again, if everything followed simple averages, you have a 1 in 4 chance of being in the top quartile in March 2013 and a 1 in 4 chance of being in the top quartile in March 2015, indicating that 6.25% would be in the top quartile in both years if everything was random. Simple variance. With only 682 funds in the study, we would obviously expect there to be a certain amount of variance from the “random result”. Therefore, the 5.28% actual result compared to the 6.25% expected could easily be as a result of chance. Results are after fees. Fund managers may increase their fees when they are in the top quartile as they can justify charging higher fees. However, this will clearly impact the results two years later. The 682 equity funds may be designed to perform well under different conditions, with some performing better in times of growth vs more defensive funds that will perform better under falling markets. However, given the time frame of the study, I actually don’t think that this would have a big impact. The S&P 500 increased by 19.44% in the two years to March 2013, whereas the S&P 500 increased by 31.34% in the two years to March 2015. Whilst these figures differ, both can be classified as periods of strong growth. Nothing here tells me anything new. The arguments for passive investing tend to come from the downfalls of active investing: that it’s is a losing game, other than for the stock brokers and fund managers who get paid huge salaries and bonuses as a result of our investments. So, stop buying yachts and supercars for these fund managers (Bill Gross, who ran the Pimco Income Fund, was reportedly paid a $290m bonus in 2013). Instead, it might be a better idea to invest in low-fee market tracking EFTs and funds that you can just forget about for the years, safe in the knowledge that you won’t beat the market, but you will BE the market! 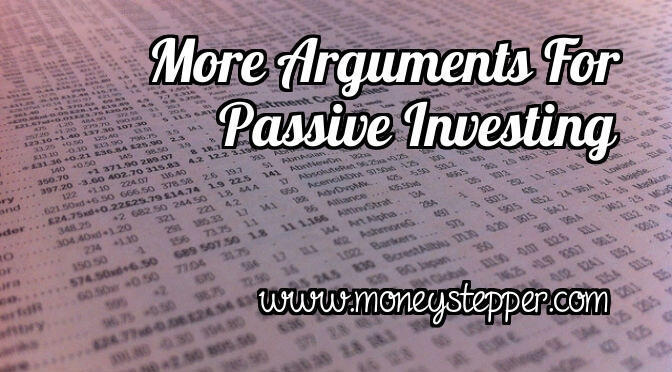 Found our arguments for passive investing insightful. Then, come back on Thursday to read about what happened before I learned this lesson in a confession post: “Hi, I’m Moneystepper and I’m a TERRIBLE investor”. Is investing in VCTs a good idea? Q&A 23 – Do I Pay Capital Gains Tax If I Don’t Pay Income Tax? Q&A 22 – How Does Quidco Work? While the markets been on a crazy up and down ride for most of 2015, I’ve been quietly sitting in the corner just collecting dividends and continuing to buy. I’ve made several thousand in dividends without spending more than 10 minutes a month investing. This is as it should be 🙂 Active investing is for the 1% of folks that can sit in front of their trading computer ALL day. If that’s not you, then surely the sharks will take your money and you’ll under-perform the market IF YOU’RE LUCKY. It’s much more probable that you will lose large sums of money trying to day-trade with the big boys. Agreed. Active trading has its place, and there are ways to make profits if you are willing to dedicate your life to it. If you’re not, figure out a way to be passive, or even better, find investments outside the stock and bond markets.